Getting organised this year just seems to have been hard ! 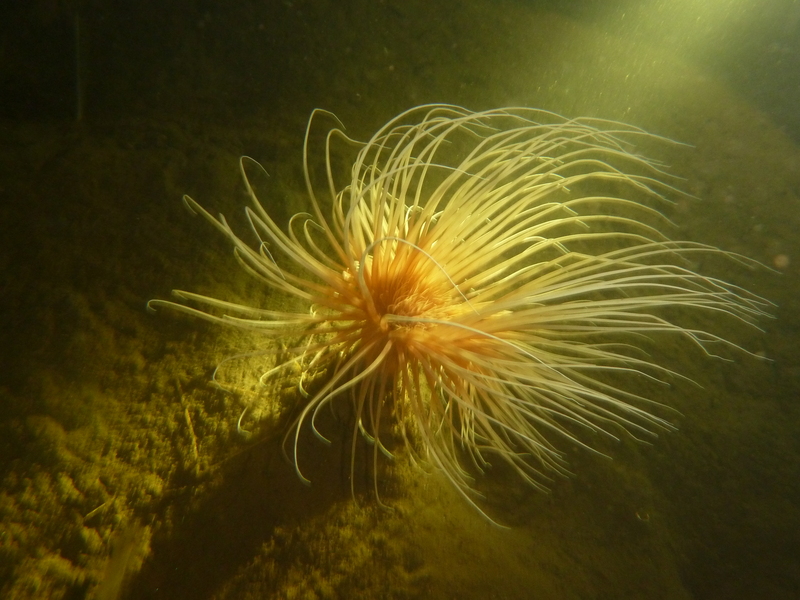 Mid March and I felt I needed a shakedown dive as it had been so long since I’d been in the water, I was starting to lose interest. To be honest the winter weather had promised snow conditions and the lure of winter-sports held sway in the weekend’s activities but fickle as the weather is, the few days when I could actually get time off coincided with gales, closed snow gates and a general lassitude that saw me going no further than the shops. But March and still thinking about shake down dives seems almost implausible for an all year round diver. And we won’t mention Man-flu. Was I going to get in, could I still do it and would the kit actually work. Nothing was further from my mind than diving when I rang Paul up for a social chat, “how you getting on ? what! the girls are off doing what! Oh! er Sunday, will be out late on Saturday, where, don’t know where that is but I’ll find it, keep your phone on ?” Lassitude, effort, followed by grumpiness and then the realisation that all the shinnies were spread around the house is various states of dis-assembly – “Oh Sh*t!”. First off I had to find the shed keys to fill tanks, then I had to find the tanks buried as they were under tarpaulins and general garage gauno. An hour later and behind schedule saw standard OC equipment thrown in a bag and a mental note to find hood and gloves and not to forget the undersuit, BCD and weight belt when I packed the car. 01:30 am I found a pillow and drifted into the arms of Morpheus quietly swearing about …. everything. I’m not sure if the dog or the alarm woke me but with lots to do I was up and still half asleep packed the car, remembering the torch and there was something else I couldn’t quite remember so walked the dog. Ah that was it, the undersuit, where did I put that. The chart suggested a small wall and the topography looked interesting so having moved over the ‘wall’ a couple of times with the depth sounder we decided that two waves was safest and Edward and I kitted up, buddy checked and rolled off on the point. &^^$$£$%%^&^&*& , the surface layer had zero vis! Literally side by side, we descended and luckily once through the fresh water, the vis cleared and we landed on a small wall and gully that led down past an anchor to boulders. 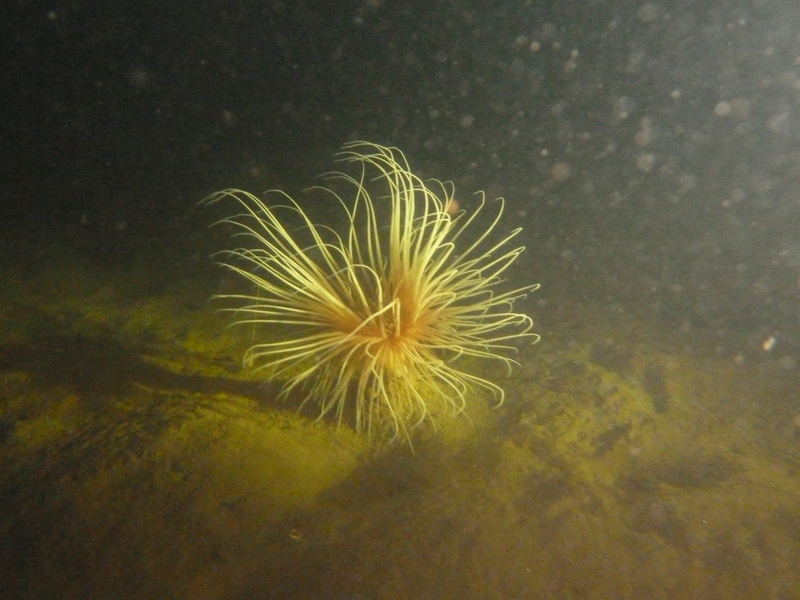 Lots of plumose anemones, shriveled up in the dark and cold covered the glaciated rocks while a few small pollack swam nervously past, flashing in the torches before escaping into the darkness. 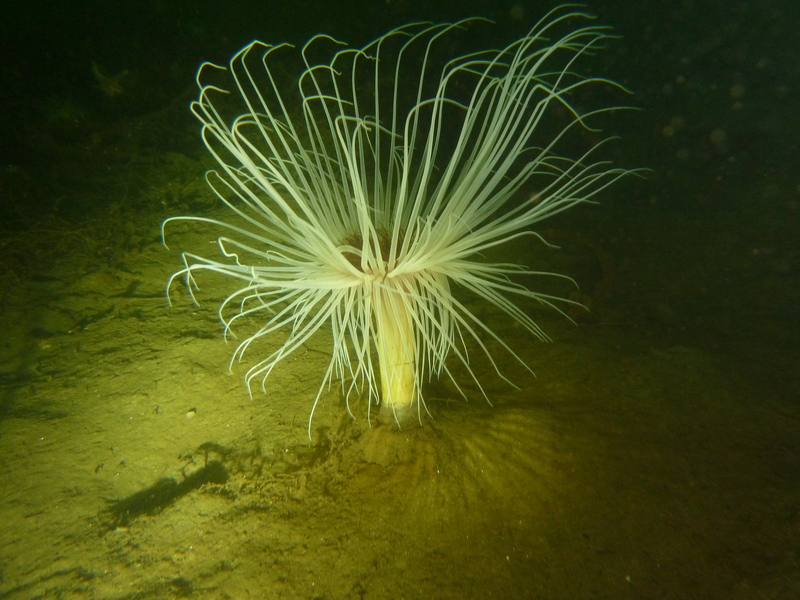 A scallop or two, small and lonely were left and horseman anemones, large and fat provided a dash of color in a greeny grey world. 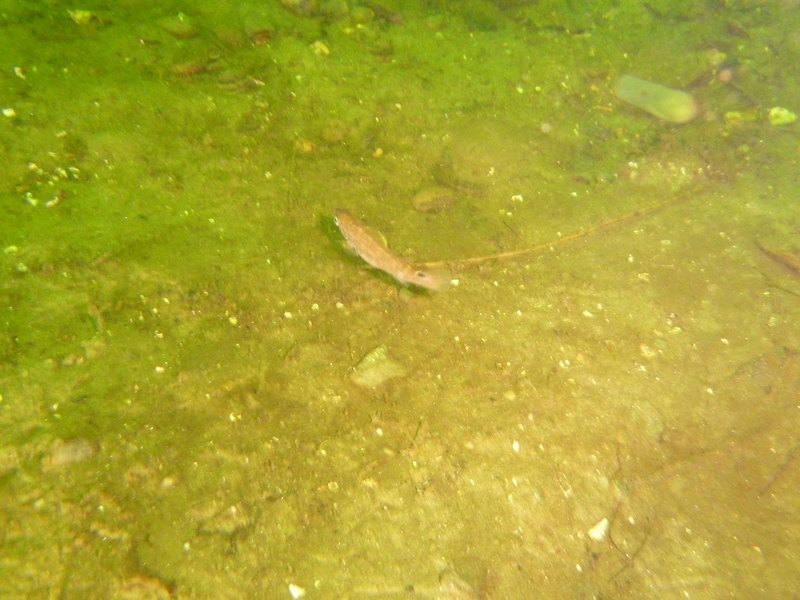 Perhaps the highlight of the dive was a large mature pipefish, fattened by eggs it was carrying. Edward and I descended until we reached mud and just edged into a decompression penalty before returning to practice a couple of drills in the shallows while doing our stops. The pickup was excellent and very professional, mind you we would not have expected anything else! Diving pairs swapped over, Paul and Ewan dropped in on the point and followed a similar route, spending more time at the anchor and on the life encrusted boulders that provided the photo opportunities for Paul. Excitement was briefly injected to the job of surface cover when two MOD Police rhibs sped rather close to the divers and we had to position ourselves to divert them away. 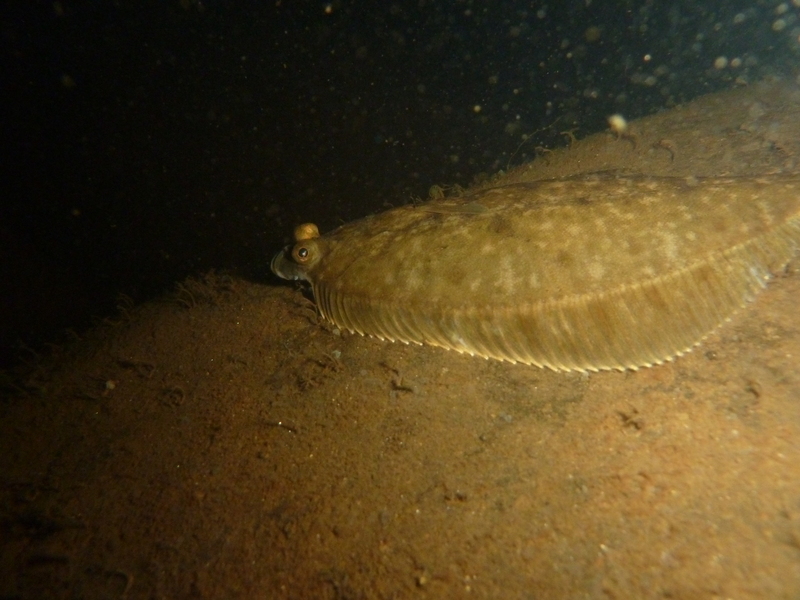 The MOD use the far side of the loch for high speed travel in deference to the popularity and use of the Finnart dive sites, so we must have provided some variation to their patrol routine. Paul and Ewan’s bubbles moved up-slope and a DSMB popped up which they quickly followed. After recovering them we skimmed back across to the A-frames to beach and disembark the kit after a excellent little dive. With everything unloaded, Carrick Castle majestically disappeared down the loch and all that was left was to pack the cars and head home. An excellent day. Thanks to Ewan for providing the boat and the Edward and Paul for the company. From a collective shakedown perspective , I was over-weighted but also a little cold, but things will warm up soon. My trim was all to pot, tank way to far up the BCD and the trim weights I had in the jacket for pool use (and forgot to take out) didn’t help at all. Seemed to be a lot of dangly bits and revisiting how gauges, torches and regulators are stowed is no bad thing remembering to check you can reach them underwater. I think this months Diver mag had an article about getting back in the water and yes we had issues with DSMB reels running smoothly and tangled lines, computer batteries saying no and the proverbial mask straps and buckles…. 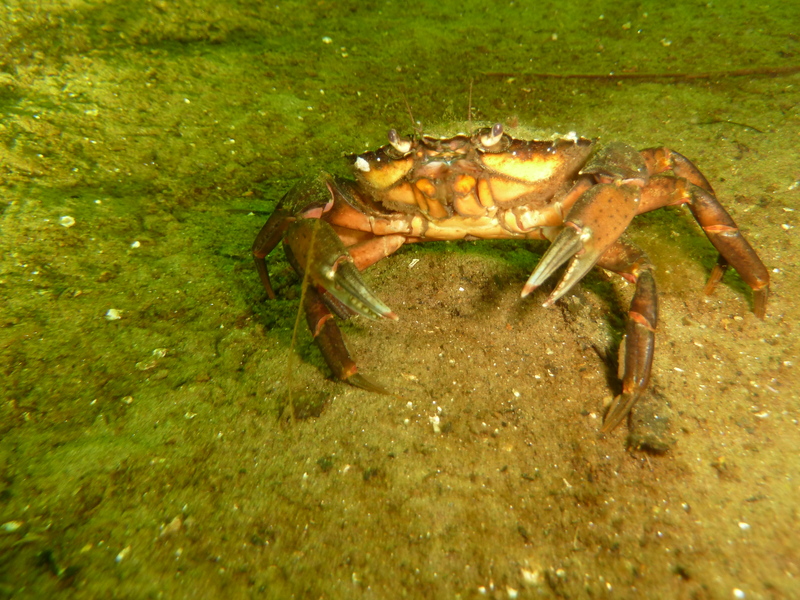 Perth BSAC is starting their try dive season again soon. For anyone who wants to see if diving is for them and try diving in the safe confines of a swimming pool then it’s time to get in touch and book your space. 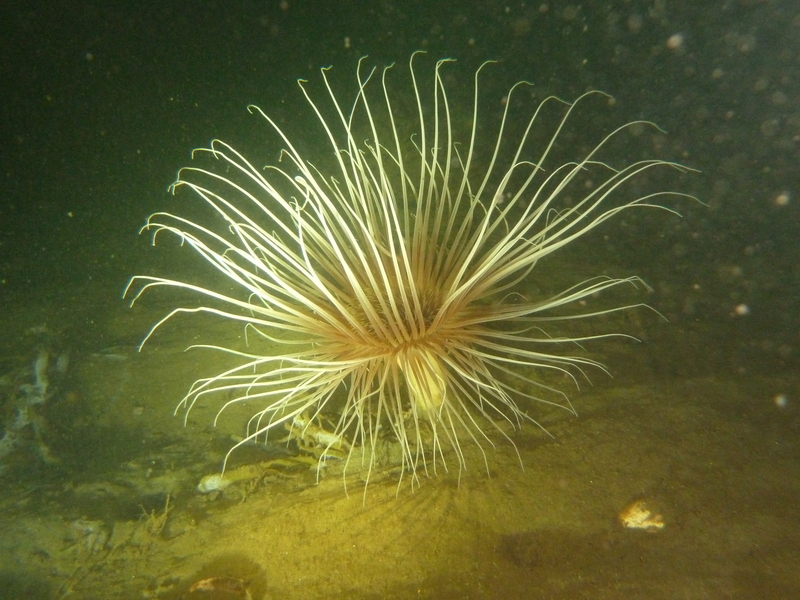 Being located on the borders of the Scottish Highlands but within the Central belt, Perth is ideally situated to access many of the most popular dives sites throughout Scotland. It is a great place to learn and start your diving career. “Sunday?”, “Yes, where?”, “OK, When?” Ah, the joys of shore diving ! And so it was that a small group of divers from Perth and Crieff met in Tyndrum before moving off to Furnace on Loch Fyne for a days diving. 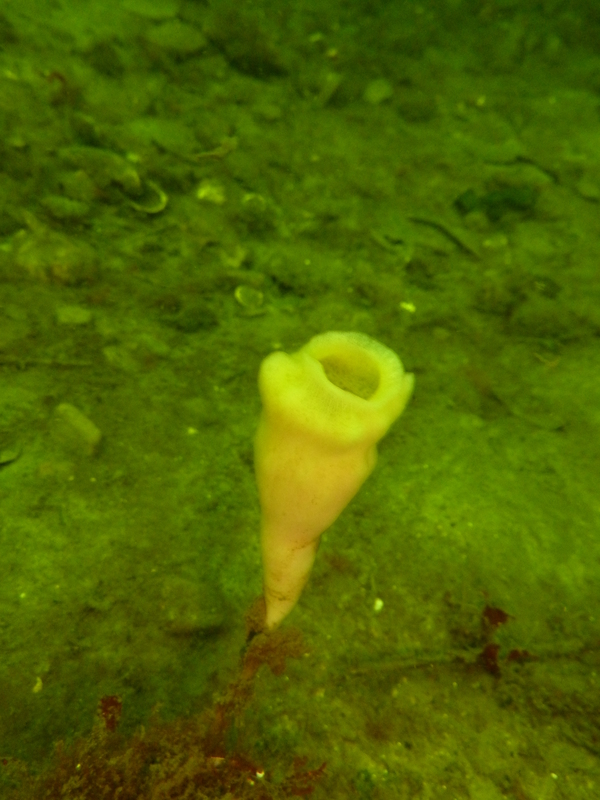 Todays venue was Furnace were Dogfish reef was our chosen site offering a both a good scenic dive and a variety of depths to suit. Unfortunately the relationship between divers and the local community has been spoilt by a small and thoughtless minority whose actions have provided offense. The local community is now doing all it can to discourage divers and actively blocks the entrance to the council owner car park making it just that little bit harder to get in the water. We had the site brief and then made a couple of trips to get the kit down to the water’s edge before the first team were off onto the reef. 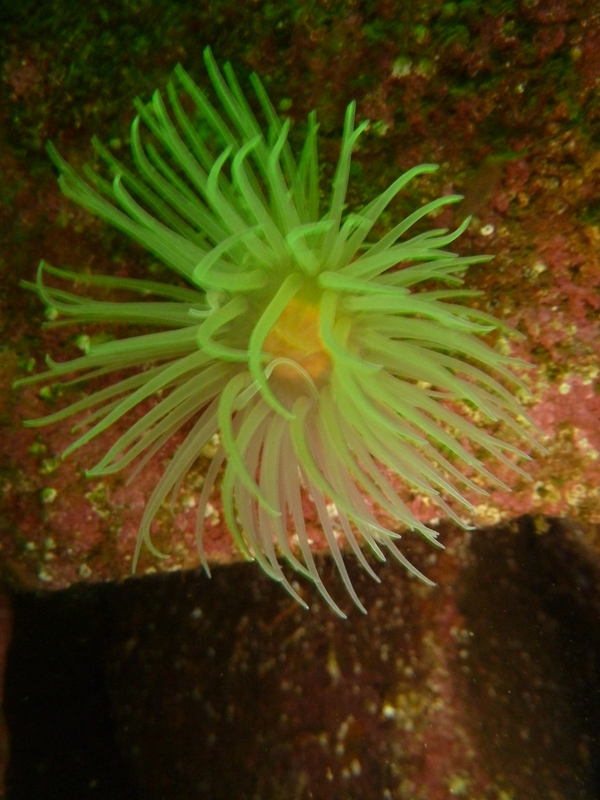 With a high tide they had a few meters of wall left to play with as they explored the depths of the main reef reporting nudibranchs, sealoch anemones and some very large fish. The second team explored the reef to the right which while not as rocky was still a steep slope leading onto a gravel and rock and then sand. Two sets of 40 minute dives in some very reasonable vis. An interesting temperature profile today. 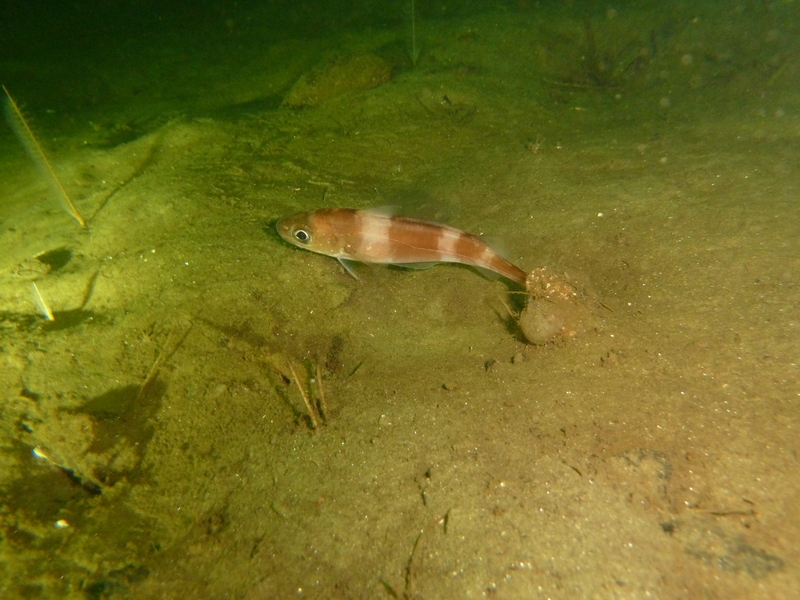 The shallows had a balmy 18°C , green and plankton rich which dropped to 8°C at 15m providing clear water and excellent viz, however there were two distinctive patches in the dive where the temperature dropped to 7°C which seemed to be associated with fresh water outfalls from the reef. These made for chilly interludes in otherwise very pleasant conditions. 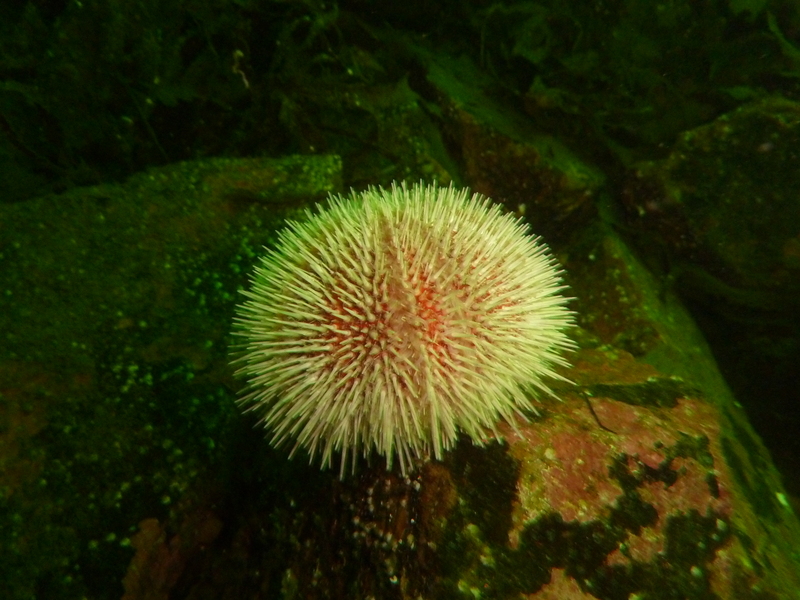 With such glorious weather it was decided to go and explore another site and with an eye on the clock we opted for Drishaig Reef further up the loch towards the Loch Fyne Oyster Bar. Steve and I had checked the access out previously and thought it was worth a look. We as a club had not dived this site for many years and indeed it was a new one to both Steve and I, though Hamish and Maureen may have previously done it with the ‘Old club’, so we set off in the hope of more scenic surroundings and to find the layby. Have to report that the walk down the bank from the layby is rather steep and not for the week of knee! However once on the cobbled beach we were quickly in the water and Hamish led the way over sand and onto mud where a forest of slender seapens appeared. Further down the slope we found a nephrops bed, with burrows and the occasional prawn displaying aggressively in the open. 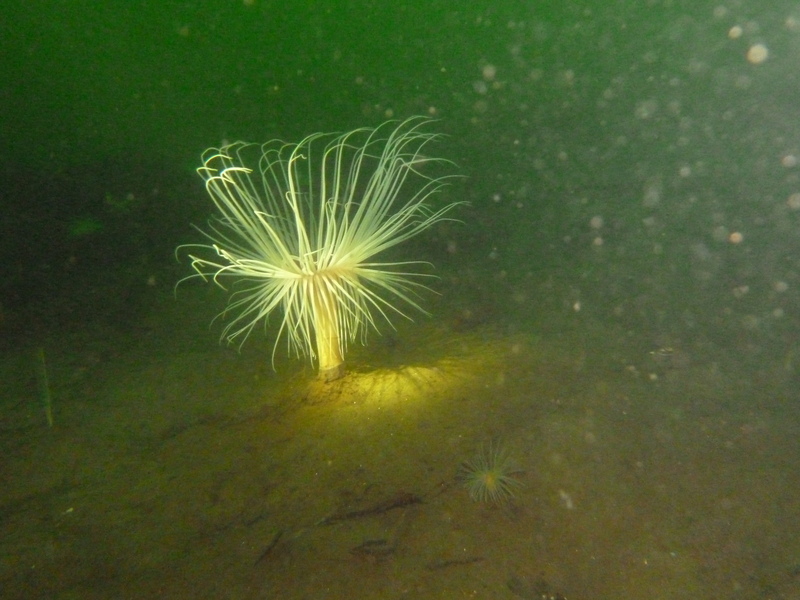 Some fantastic specimens of the fireworks anemones appeared iridescent in the gloom. Rather too quickly our bottom time was used up and we made a slow ascent passing a solitary pouting and a scorpion fish to watch blennies as we did out decompression in the shallows. 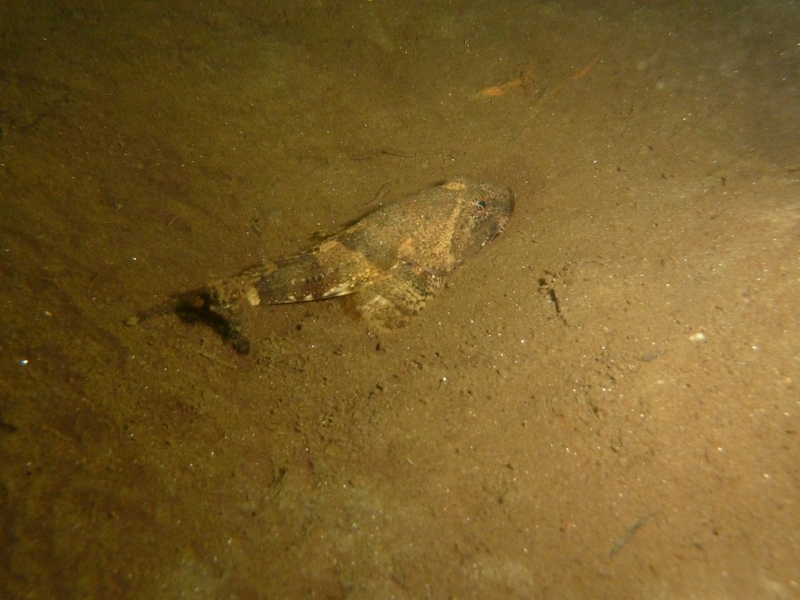 A very different dive from Dogfish reef, this was more of the inner loch genre, darker and leading to muddy slopes but with a varied and interesting selection of life. All in all a good days diving. It’s not until you step out of your comfort zone and try something a little different that you really appreciate the effort that other people put in. This month the usual organiser had asked me to stand in and run the event, well how hard could that be? I was about to find out. Preparations starts in earnest about a week before the event with a trickle of notes coming in from people asking to join and as these increase you start to worry about the number of instructors that you have in the pool to assist. You can count on most but illness and other potential commitments sees you phoning each in turn to get that oh so important commitment to show up and coach trainees. A late surge of interest and finally the ’11th hourists’ and we were set with just enough instructors to cover the variety of skills that had been asked for. Of course on the day it never follows the plan! This month I am very please to report that Perth-BSAC played a lions share in the days events with two instructors, an assistant diving instructor and an assist Dive manager, all of who were key to the days activities. Well done guys! Having completed the Welcome speech, site brief and allocated trainees to instructors, it was on to the first lesson. Paul went off to start sports diver training with two trainees from Dundee, Hamish practiced his instructional abilities under the watchful gaze of an NQI and while various other groups went about their lessons I supervised a trainee OWI putting Hadyn and another trainees through a weight check and their first dive in the bay area. After an initial shout for more weight we sank into terrible vis which we had to put up with until, basic drills completed, we were able to move into slightly deeper water (3m) where we found the vis actually improved. The stour was an edge effect and in real terms vis was quite good once you got away from the beach. 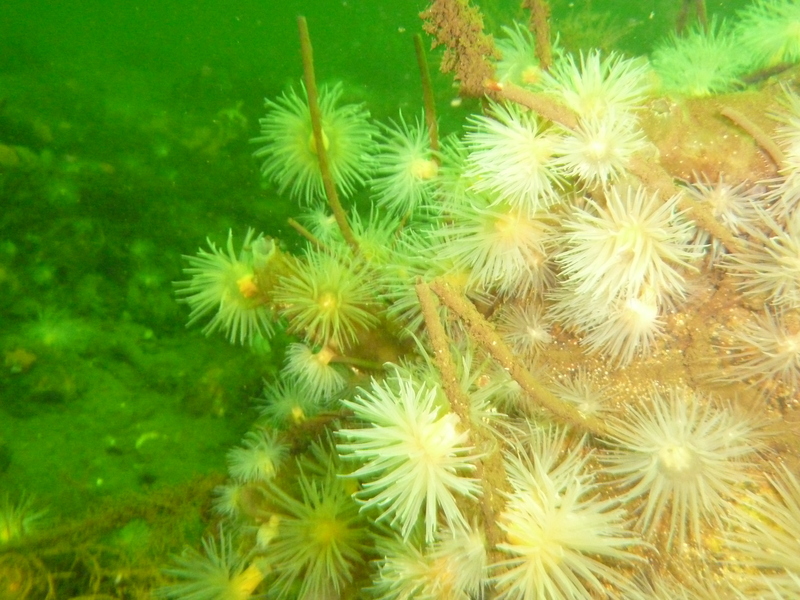 Conscious of the fact this was a first dive for Haydn we didn’t go far or deep just bimbled, looking at crabs, starfish and the other life that we usually take for granted. 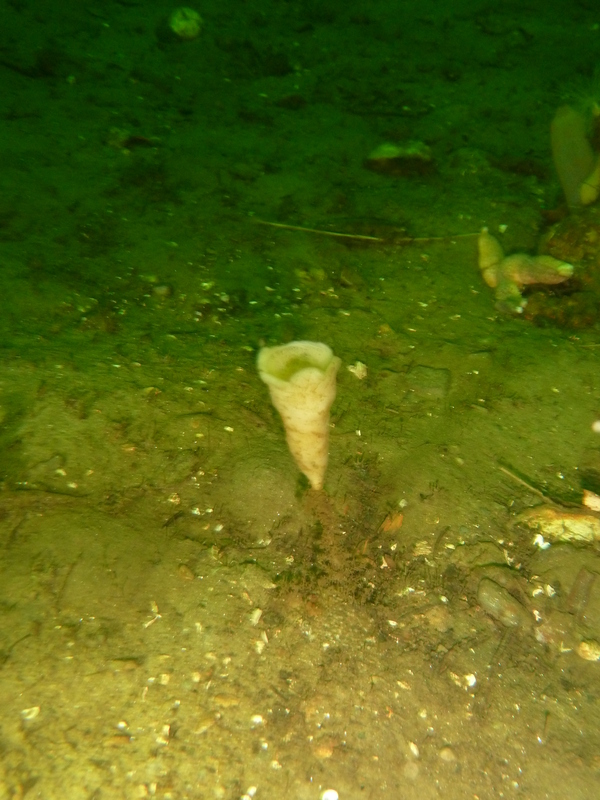 We ended up doing a clockwise circuit onto the shallow reef to the right of the bay were much to Haydn’s delight and my intense surprise we found a very large and old, admiralty pattern anchor. Next week we will go back and find the rest of the wreck! After the break and now with Euan performing the role of Assistant Dive manager things flowed more smoothly and the dive slate no longer languished forlornly neglected on the beach. Paul continued with his trainees who both performed well, another great performance there. Hadyn went for a dive along the inner reef seeing some good life including a superb Polycera nudibranch and coming out with a smile broader than his hood. Some impressive stats on today’s dives but from a club’s perspective some good training delivered, a couple of lessons signed off, a first open water dive and we found a wreck ! (anchors don’t count – Ed!) Many thanks to all the instructors and helpers who made the day possible. Remember the event runs every 2nd Saturday of the month, looking forward to seeing you in April. A couple of hardy souls drove across to the west coast for a shore dive on Sunday through some very wet landscapes. Loch Earn was full and the Glen Falloch was flooded and in spate. Loch Tulla was lapping at the A82 and sheep stranded by the rising water where clustering on small islands waiting to be rescued. After a brief surface interval, the afternoon dive saw the same teams back in the water squeezing out a second dive from the mornings tanks taking advantage of a shallower profile. Hamish and buddy went off to explore the reef again getting some impressive perspective of the angle in the excellent visibility while the other teams bumbled around to the right of the bay exploring the large anchors and chains and finding some big glacial slabs. 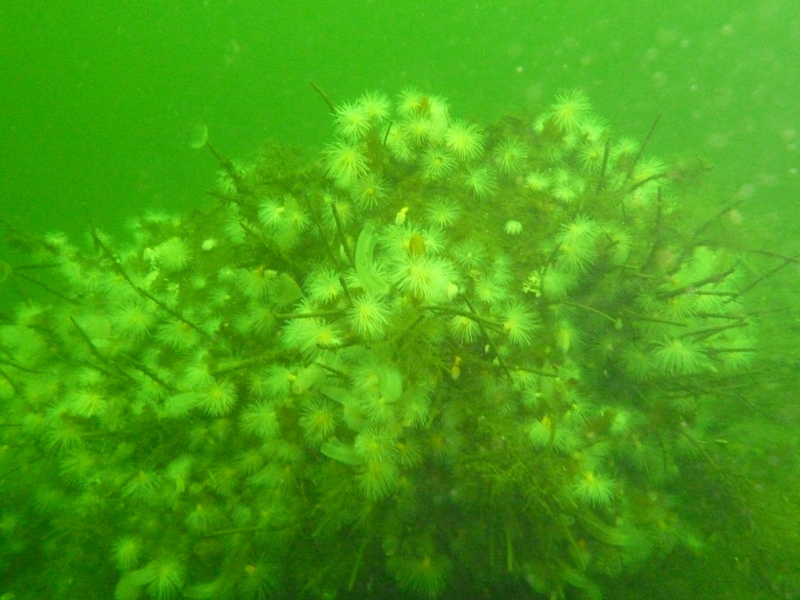 On the way back and in the shallows, the rocks supported colonies of sponges. 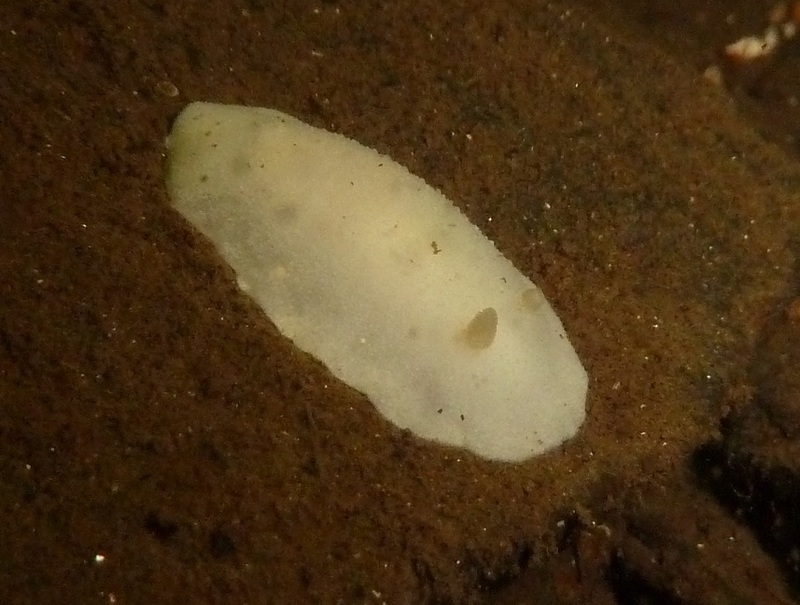 Of note was a blue rayed limpet reflecting iridescent in a torch beam and of course a couple of nudibranchs, much smaller than the mornings specimen. That was it, a final warm up in the cafe to chew the cudd before driving back to Perth although we couldn’t resist the opportunity to pay our respects to the badger! Another superb day in the water with great company and a good lesson that you can always get in somewhere if you really want too. 06:00 am, What! Another early start ! 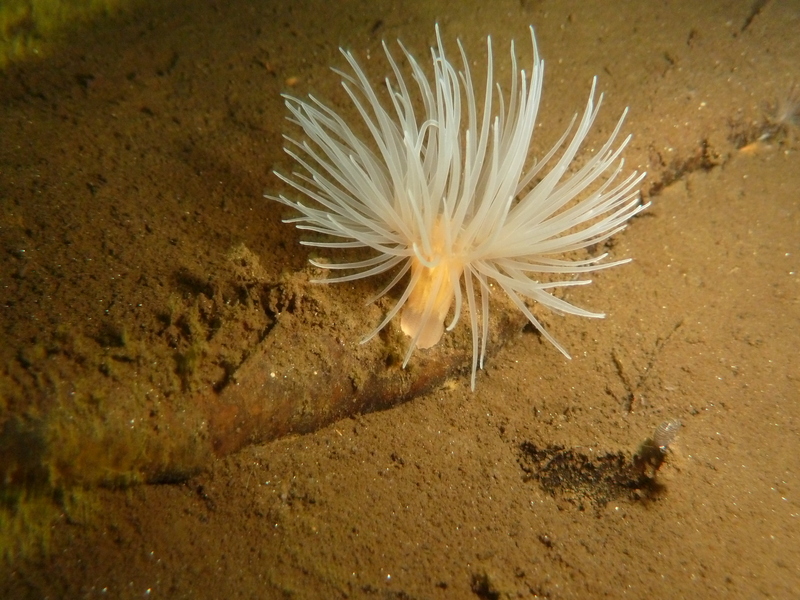 It’s that time of year when dragging yourself out of bed while it is still dark to go diving is a real test but we did well arriving on time at the club shed to load the boat and set off for Oban. The objective of the day was to firstly get some diving in and to allow Neil to complete his Dive Management practical session. Plans were a little fluid this weekend with a couple of people coming down with colds and back problems but such was the turn out that we still had a full boat , a good chance to get Deep Dancer out and exercise her engine putting in some time on the water. Of course the first problem was starting the engine which was reticent to say the least, still we are getting very adept and cleaning the plugs, ululating and rending cloth before Paul laid his hands upon the console and she coughed into life. With a boat brief and radio check completed it was time to get the show on the road! So a couple of extra checks to ensure the gear linkage was secure and that we could stop and restart the engine and we were away. The trip down to Insh Island was rough and Paul did a good job punching his way through a nasty chop to arrive at the northern end of the Island. The small Island and the skerries were not an option today due to the swell and waves but there was sufficient shelter in the little bay to the NE of the Island to allow safe diving. 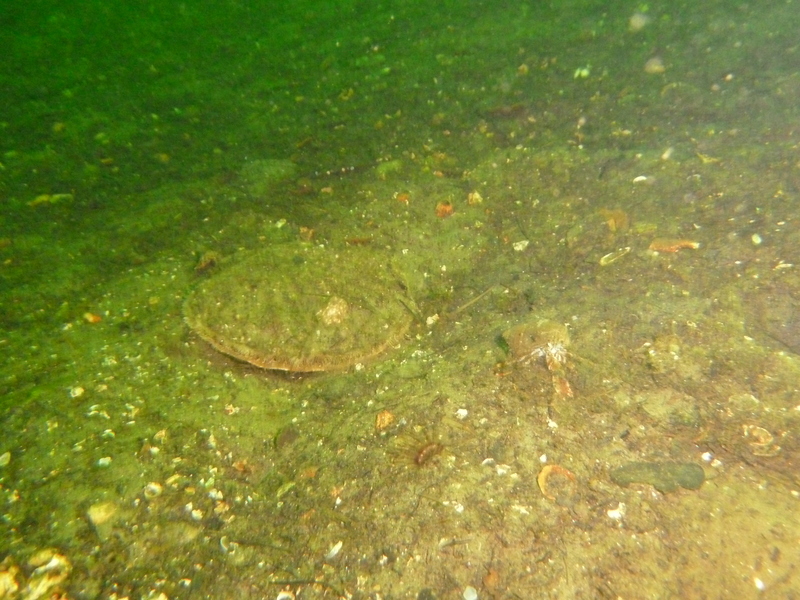 Chris and Euan were first in and found a sandy bottom, good for a few shells but not of great interest. The visibility was reasonable though a fine sand stirred up easily the tide then drifted it with you so you had to continuously move out of the silt trail you raised. The divers found themselves in an eddy and having tried to go south in the direction of the tide eventually gave up and drifted North where the current took them. 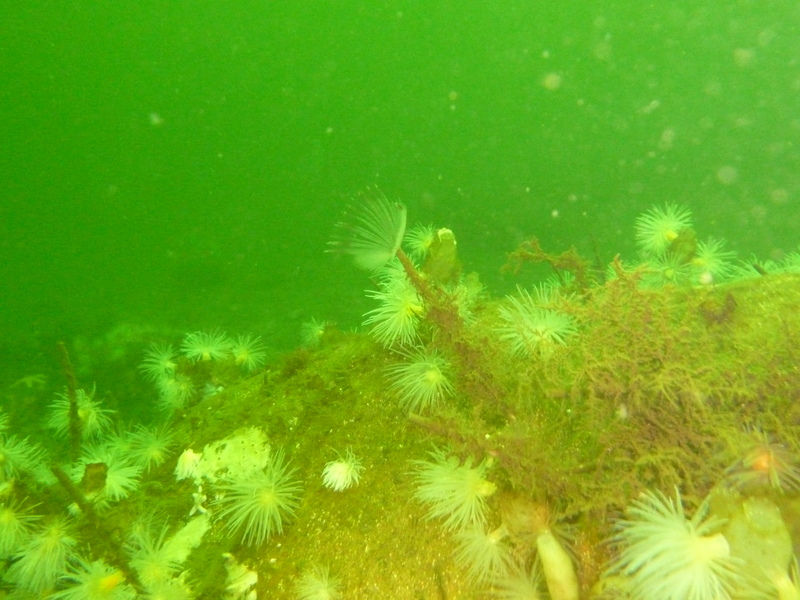 Towards the end of the dive they reached the reef that joins Insh to the Northern skerries where small walls provided a little interest. Unfortunately the current meant that the dragging an SMB stopped the divers sheltering in the kelp and they surfaced slightly earlier than plan. Mo and Fred went in in a similar place and reported a reasonable dive within the bay, having a good long dive and making a safe ascent. A quick change over on the boat and the dive manager sent the next wave in who followed the edge of the reef taking a few photos and picking up the occasional scallop. With a full team recovered we decided to head back to Puffin dive center rather than go across to Easdale for lunch as the afternoon was chasing. The trip back proved to be one of the great highlight of our diving this year and goes to show that diving off boats is about the day as much as about time in the water. Half way back the shout went up ‘Dolphin’ and we throttled back to watch. 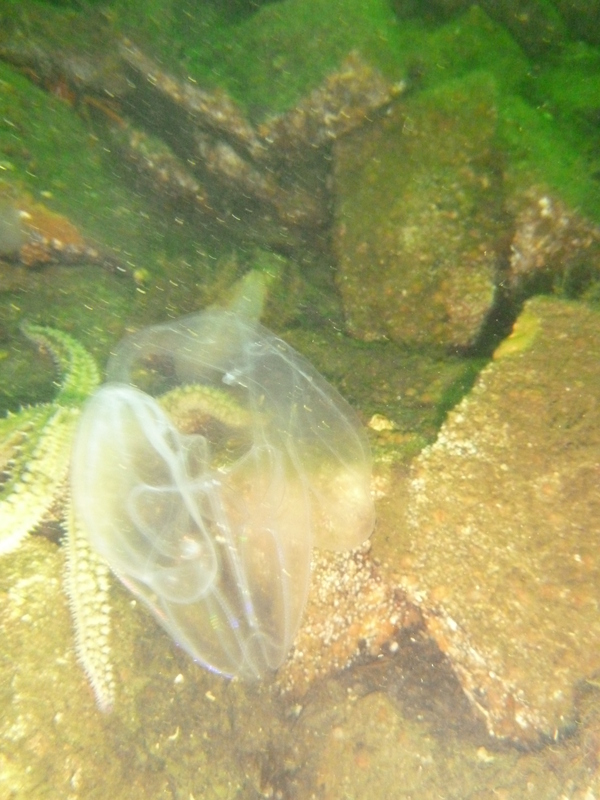 Initially a few animals were surfacing and we weren’t sure how many there were, three or five perhaps. Clearly something was going on and as we watched a tight group started splashing about with much tail waving, a smell of fish suggested they could have been feeding but it was most likely that the smell emanated for the old diver that we keep in the stern of the boat. However the splashing was only the prelude to the main act , dolphins started to jump with supreme grace and it was slight disappointing when the school drifted away from us. With everyone enthralled we set again towards Puffin but the dolphins decided they had not finished with us and started jumping, easily clearing six or even eight feet out of the water. Initially in ones and twos, some right next to the boat and then in synchronized form giving us the kind of show you would have paid top dollar for in Orlando. Here it was off the West coast for free ! A much easier passage back to Puffin followed, with a following wind we made better time and having secured the boat spent a leisurely hours over lunch, ‘grilling’ the Dive Manager on his theory (he he he he!). Ardnachuil bay was the next site, a short ride from Puffin and while not calm, a safe option. Chris and Euan were in first and having bushwacked their way through the swell and the kelp, found a sand and gravel slope disappearing off into the depth. 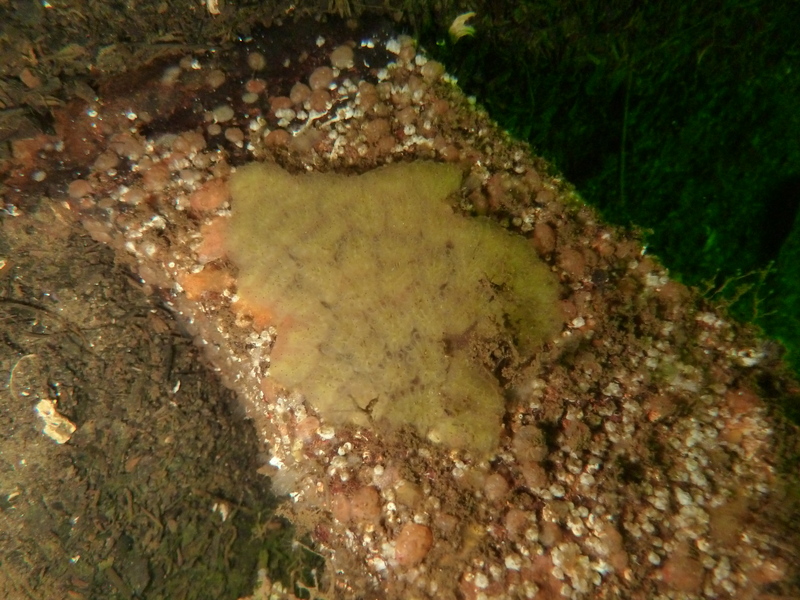 Chris reported a couple nudibranchs with dendronotus-lacteus and it’s brilliant white body easily spotted standing out on a brown kelp frond and being a new one for him. 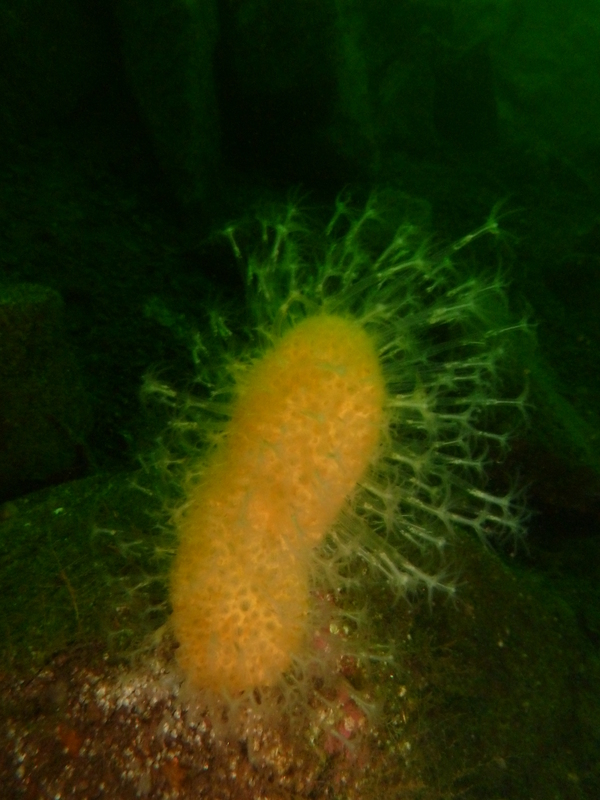 (No camera today so I’ve included a link from the Scottish nudibranch site – Ed) later in the dive, they also found a small red sea hare, perhaps the smallest one, you could possibly imagine being less than half a centimeter long. Mo and Fred reported a short dive, struggling to get out of the kelp in the challenging swell they encountered. A good effort in challenging conditions and as it had a safe outcome merits a success in my books. With the second wave of divers in the water, the opportunity for a bit of boat handling skills development was presented and man over board and indeed board overboard skills were practiced before standing on station over the divers waiting for them to surface. Paul and Steve surfaced and having had a stern debriefing from the Dive Manger they were allowed onboard before we departed for Puffin. Well done to the Dive manager there for demonstrating control over the group! The boat was recovered and kit washed down on the slip and with a final debrief from Neil the day was wound up with the boat heading off to the club store followed by Chris and Euan. Congratulation go to Neil for successfully completing his Dive Manager practical as part of his Sports Diver grade training, he did exceptionally well keeping control over some experienced divers with an accumulation of years of bad habits. The committee have yet to validate his qualification level but I look forward to diving with our newest qualified Sports Diver in the not too distant future. 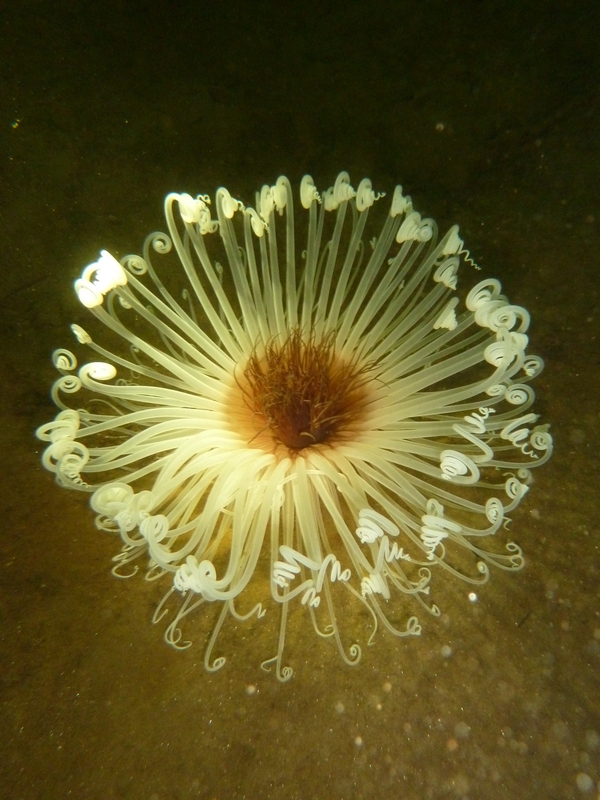 Thanks to Steve for organising another successful days diving and to Paul for towing Deep Dancer. Nearly four weeks of glorious summer came to a crashing end with thunder and lighting just in time to raise a few doubts about river diving on Wednesday evening, however driven by an insanely enthusiastic Paul, the cats were herded and we rallied at the Angler’s Inn in Guildtown at the appointed time. 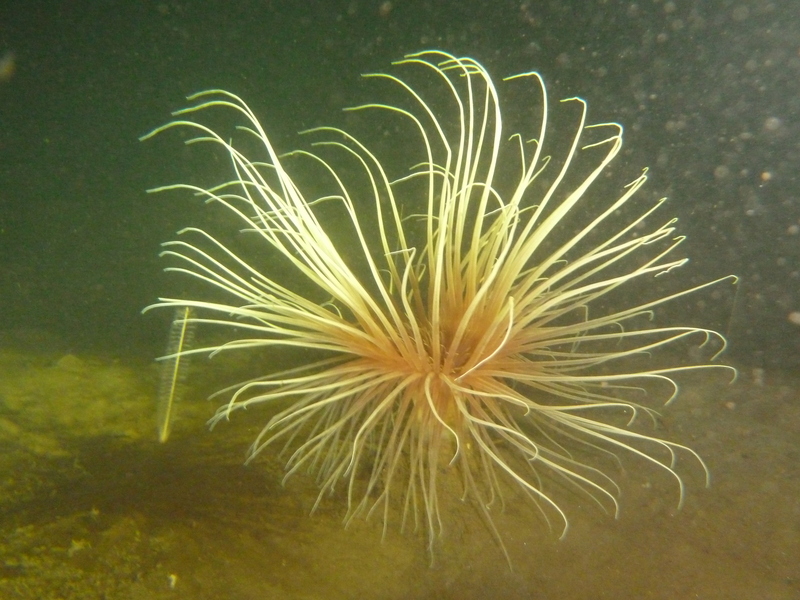 Diving the river Tay raises a few eyebrows, locals who have an interest, whether commercial or environmental, keep a sharp watch on suspect activities and a group of divers on the Tay meets this description to a tee. So it was that we met one such local and explained our intentions who promptly hurried off to beat the drums leaving us with the equipment to strenuously carry down to the river and watch the canoeists play on the rapids for a few minutes while we caught our breath. 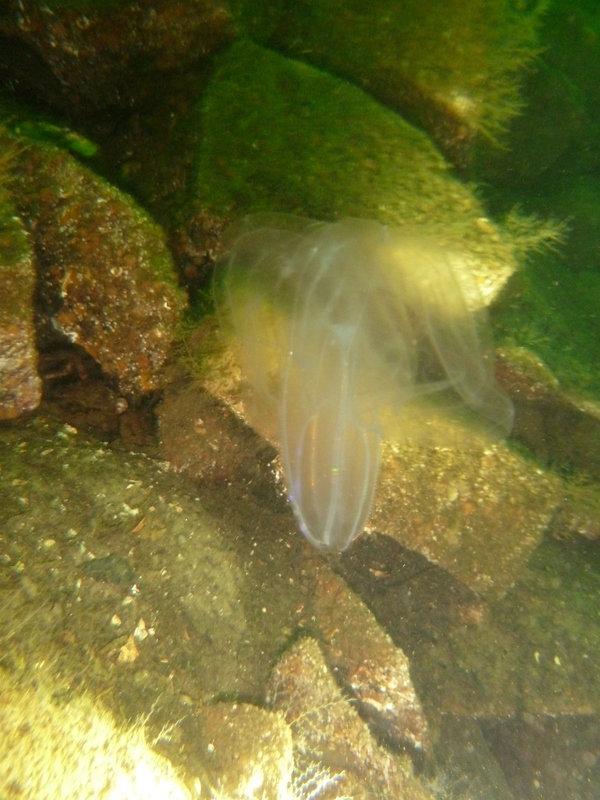 The overnight rain had raised the water level by about a foot but the river looked dive-able so we went in in two groups, hugging the wall beneath the linn to avoid any strong currents. The vis was not very good (Is this an understatement? – Ed) and the further into the pool the worse it got and with all light penetration gone at about 8m most of the dive was carried out within a torch beam. Underwater obstacles are always a concern and with overhung ledges, trees and current we took a great deal of care not to work our way into a corner though we had no idea what was above us, as Steve put it, it was as close to cave diving as we would be likely to come without going into a cave! The plan on this sort of dive is to slowly crawl along the bottom, using boulders to pull yourself along rather than fining. You creep up on the life or let it come to you and it was remarkable just how much life there actually was. Several large salmon as well as numerous smaller ones were either asleep on ledges or wedged between boulders, occasionally one shot out of the darkness and making straight at us turned at the very last instance and was gone. dum dum dum dum dum dum ….. Trout were there as well , large brown trout, speckled and dark. 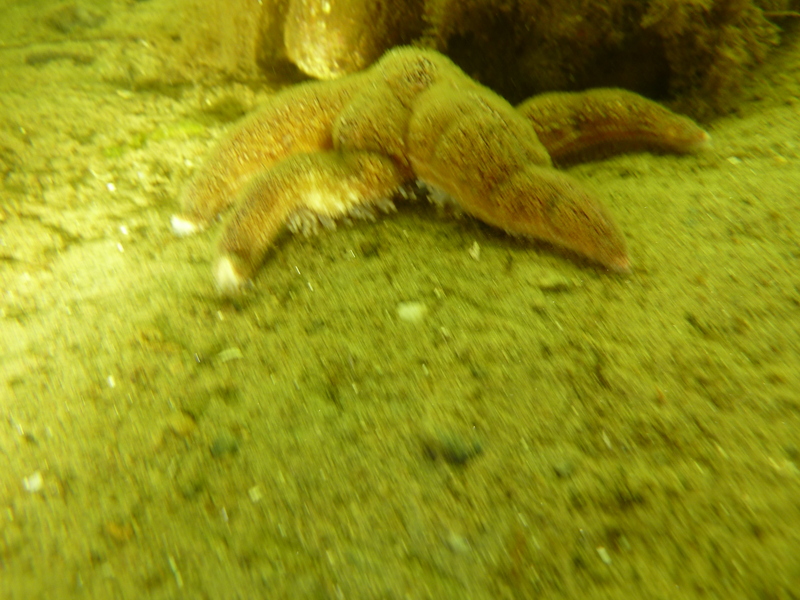 These were much more timid than the salmon and harder to approach. 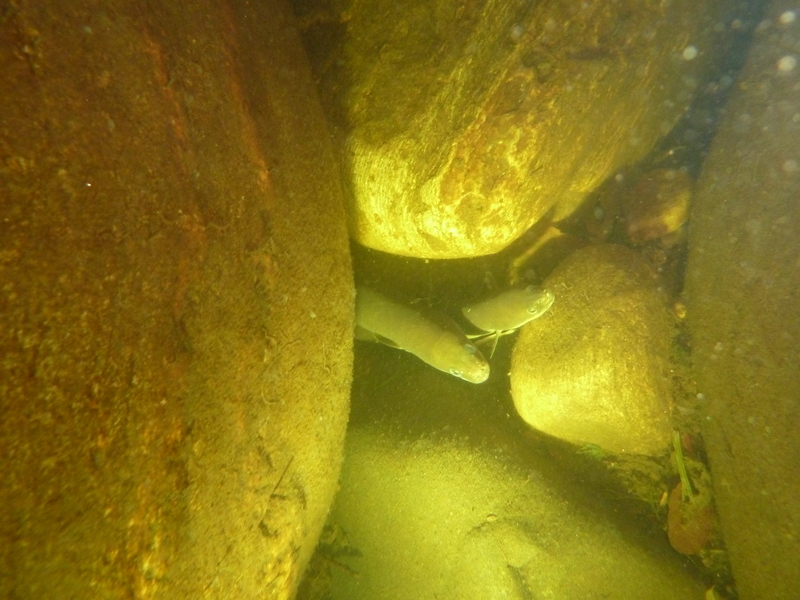 What was interesting was the number and the size of the eel population, some really large specimens gliding past while others had taken up residence beneath boulders. It was interesting to see this little chap, obviously lost ! 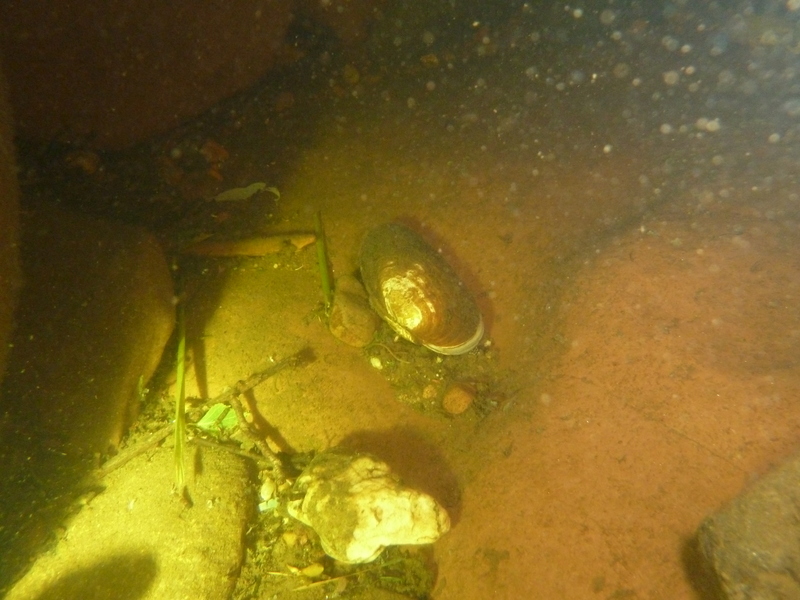 The freshwater mussel occurs in the Tay system and we came across this specimen below the falls. Clearly washed down from further upstream. Initial thoughts of relocating it to a gravel bed were tempered with it’s protected status so we left well alone. 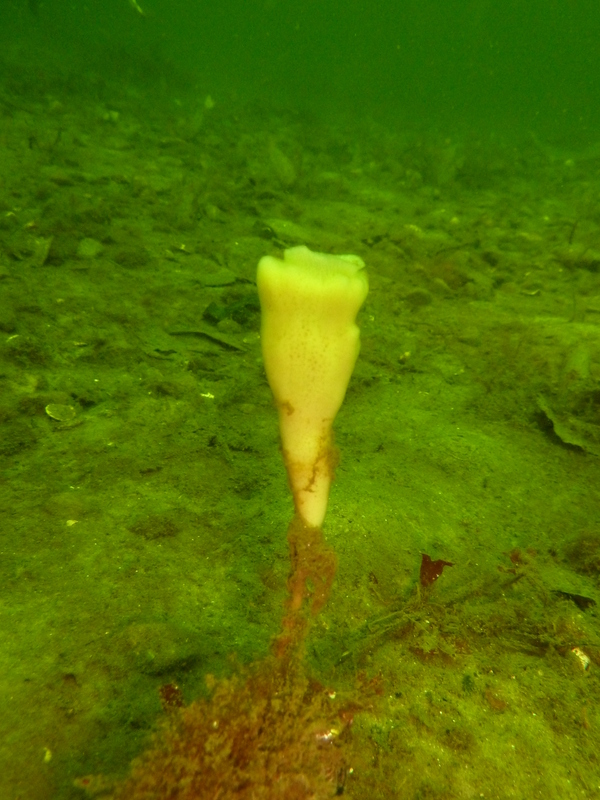 It has always puzzled me how the spat of these molluscs get back up the river system after spawning? Having made it across the pool we turned and using a compass made our way back finding a tree noted on the way out and then a wall, eroded with pockets where golf balls had become wedged. Finally as we started to ascend, surface eddies and current became noticeable and only avoidable by hugging the edge of the pool. Here while doing a safety stop we had the opportunity to have a good look at the fresh water sponge that appeared white on the rock. Finally, completing the stop I had the opportunity to pick up round lead shot, which looked initially like musket balls but turned out to be harling weight. All in all a very esoteric dive, would I do it again, yes absolutely but only after another three weeks of glorious summer weather. Thanks to Paul for organising and to Spike for coming and providing local knowledge and shore cover. Paul has loaded some excellent photos here, the water was a little murky for my camera without a strobe. Just for the record a standard summer low water for the river (bit like tides – Ed) the team recorded 17m in the middle of the pool and the water temperature was 21 degree C.
Paul’s photos, which are a lot better than mine!